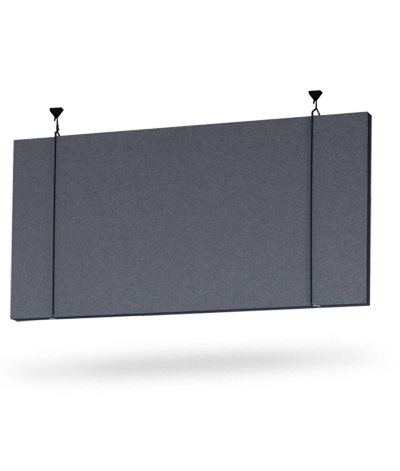 EFFEKT improves acoustics and reduces sound propagation in open spaces. EFFEKT is manufactured in three standard formats and has a thickness of 50 mm for good sound absorption. EFFEKT is suspended from the ceiling using hangers available in the white or black. EFFEKT comes with the smooth surface of the core material EcoSUND® (White, Black or Grey RAW edition), or laminated with Hush fabric on both sides. EFFEKT is available for express delivery in RAW edition or with the five express colours of Hush. EFFEKT can also be delivered with DUK Acoustic Nonwoven with Rockwool core.